“Journey through our anecdotic revue,” implores a narrator-character called Leading Player in this 1972 Broadway musical hit, scored by Stephen Schwartz. That meta-theatrical framework has all too often been an invitation to directors to over-conceptualise the show, whether as a cyberworld gaming fantasy as in the Menier Chocolate Factory’s 2011 production, or as a full-blooded circus show on Broadway in 2013. Director Jonathan O’Boyle actually trusts the show on its own terms, honouring its title character’s rite of passage as he searches for an elusive fulfilment in his life. The show also offers one of the most profound and moving treatments of depressive illness I’ve ever seen in a musical (and it’s something that runs in families: Pippin’s grandmother also admits to battling it). O’Boyle and his choreographer William Whelton respect the show’s iconic past as the original creation of director/choreographer Bob Fosse – hats, hands and ostrich feather fans are used in a Fosse-like tribute. But there’s also a warmer, gentler flow to this dance of despair as projected by the engagingly open-faced and tousle-haired Jonathan Carlton in the title role. 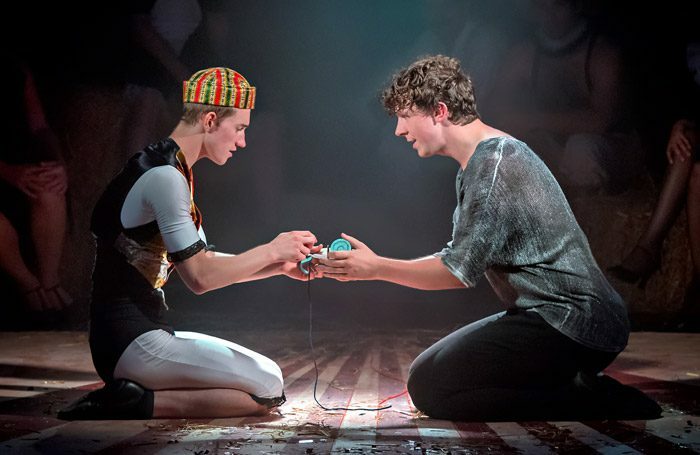 The commanding Genevieve Nicole is both scintillating and chilling as the taunting voices in Pippin’s head, while Bradley Judge as his half brother Lewis and Mairi Barclay, doubling as both his stepmother and grandmother, provide good comic support. Stunningly designed by Maeve Black with a new false proscenium behind which the band sits, footlight bulbs enclose a rectangular tongue of a stage that the audience is seated around on three sides as Schwartz’s richly melodic score is played with punchy verve by Zach Flis’ nine-strong band.